2525 St. Charles Avenue was recently devastated by a house fire. The following excerpt from the PRC archives is from the December 2011 issue of Preservation in Print, when the historic home was featured on the PRC’s Holiday Home Tour. 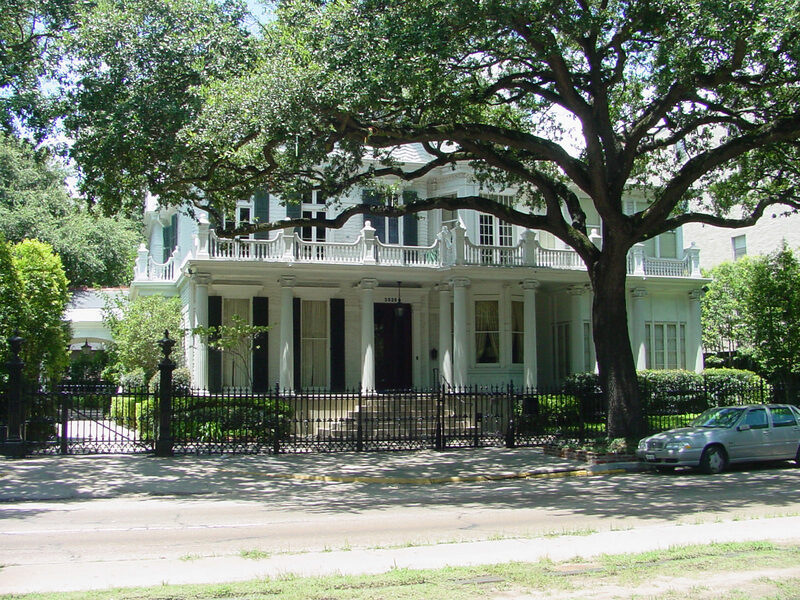 The Queen Anne style mansion known as the Morris-Downman House is a widely known historic landmark. 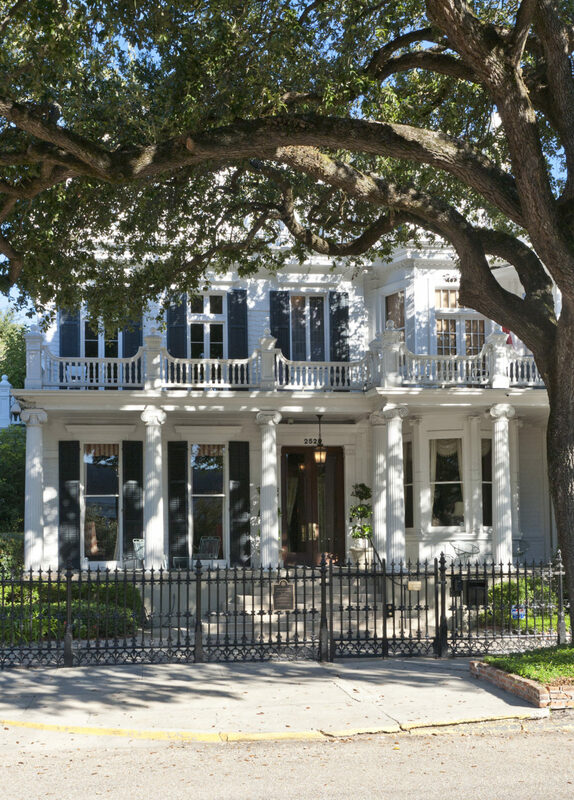 This house has a longtime and celebrated relationship with the Krewe of Rex, which is the reason the parade crosses from the “river side” of St. Charles Avenue to the “lake side” of the Avenue mid-parade. 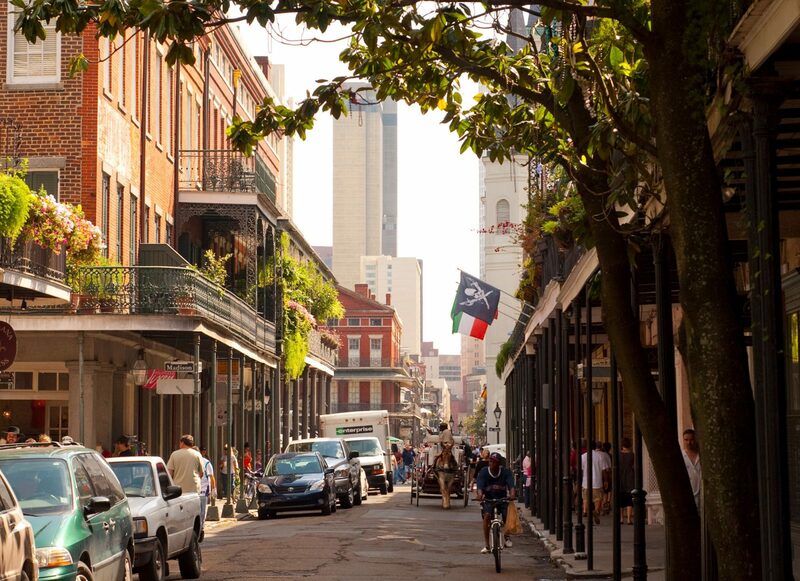 Past residents include a legacy of Carnival royalty, most notably Charles H. Downman, Rex of 1907. Ever since the reign of this Mardi Gras king, the current king has stopped the parade here to receive a formal toast, and to toast all the former kings and queens who have gathered here over the years. It is believed that this house was built by famed architect Henry Howard for Charles Miltenberger sometime prior to 1865. Tax records from 1865 described Miltenberger’s property as a “fine house and grounds”. Due to Miltenberger’s business connections, it is speculated the decorative fencing currently surrounding the home may have been produced by the Philadelphia firm Robert Wood and Co., one of the country’s premier manufacturers of ornate cast-iron fencing. After Miltenberger died of typhoid pneumonia in 1888, the house was advertised in the Times-Democrat as a very fine residence and was sold at auction to Cora Hennen for $27,000. It is believed that Hennen then hired architect Thomas Sully to remodel and enlarge the home, clothing the core building with an array of decorative architectural features popular at the time. Some details, such as the Ionic columns and classically inspired ornament, seem to be vestiges of Henry Howard; while other features, such as the asymmetrical plan, decorative shingle siding, and gambrel roofs are typical of Sully’s design style. Cora Hennen and her affluent husband, John Morris, were a prominent couple in Westchester County, New York and visited New Orleans only during the winter season. Morris had a variety of business ventures, but he was best known for managing the Louisiana Lottery. The Morrises had three sons, each of whom reigned as Rex. In 1899, the house was sold to Robert Moore, a young Irish banker, for $28,000. In 1906, Virginia native Robert Downman purchased the house and contracted for various alterations and repairs, including the extension of the front porch. Downman, who was instrumental in the development of New Orleans East, had two daughters, Sadie and Virginia, with his wife Anne Cameron. 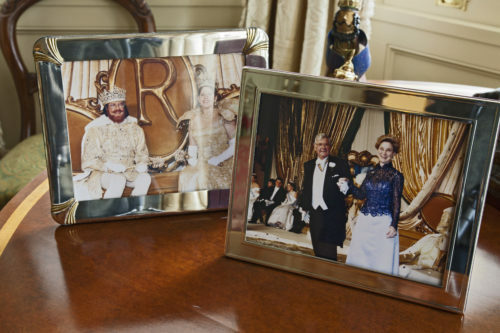 A year after moving in to the home, Downman was named Rex and was the fourth resident to reign as a Carnival monarch. Sadie became the fifth in 1915. After Downman’s death in 1928, Anne Cameron continued to live in the house until her death in 1942. Four years later, her daughter Virginia inherited the property and lived there with her husband, Edouard James Kock. In about 1980, architect Barry Fox and contractor Lawrence Johnson renovated the home. The house is still occupied by the Downman-Kock family – Anne Kock Montgomery (daughter of Virginia and Edouard Kock) on the lower level, and next generation Billy and Anne Montgomery Grace on the upper level. 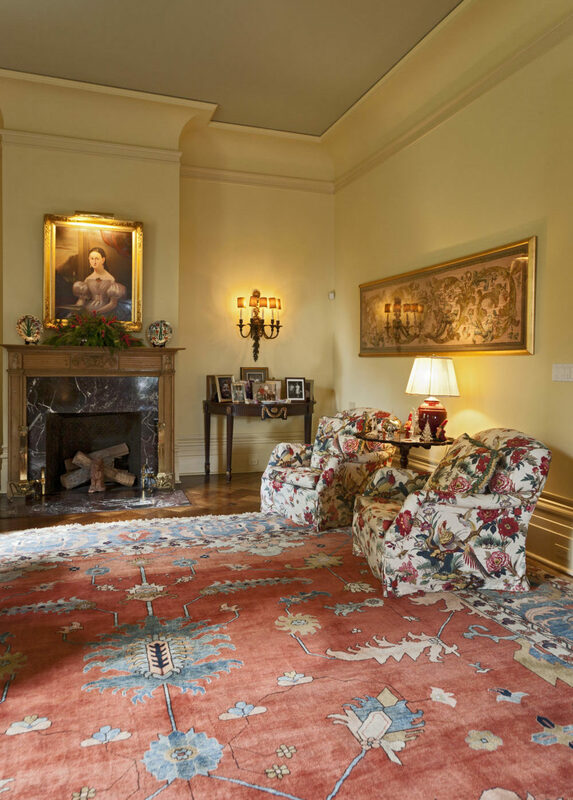 After moving back to the family home in 1996, Anne Montgomery and her now-deceased husband, George, decided to “lightened up” the living room by removing the velvet drapes, dark red damask walls and mahogany bookcases. Now, the beautiful coved molding and light colors emphasize the room’s grandness. 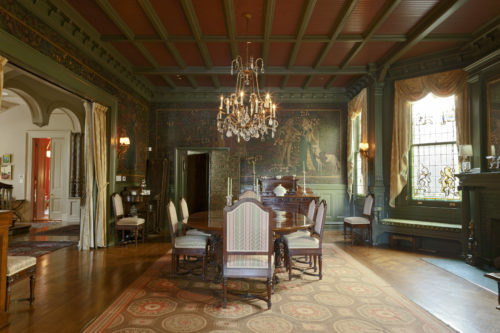 The living room features a portrait of Anne painted by Robert Bruce Williams in 1970, and a portrait of George’s relative, Anne Liza Vale. The eclectic art collection also includes a George Dunbar piece in the hall, a needlepoint banner of unknown origin in the living room, and a giraffe sculpture in the sunroom. Anne’s favorite space is the “billiard room” located down the hallway at the rear of the home. The lacquered orange walls, painted by Keith Guy in 2006, also make it the most unique room in the house. An attic fire in June 2007 caused the formal dining room to undergo an unanticipated renovation. Water damage to the room led Anne to commission a restoration artist to restore the mural. The artist uncovered many details of the mural not visible even prior to the damage; a case in point is the unicorn that was previously believed to be a horse. Another unique detail in the dining room is the family crest pictured in the stained glass windows. The Montgomery home is filled with tradition, including a special one during the Christmas season. Anne Montgomery places her Christmas tree on the Uptown side of the house downstairs, and Anne Grace places hers on the downtown side upstairs. This way, cars traveling either way on St. Charles will always see an illuminated Christmas tree as they pass by the home.